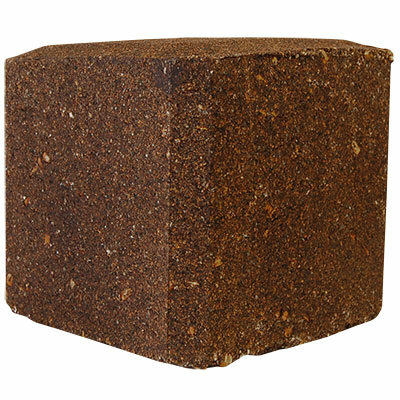 Keep deer fed and healthy in their natural habitat using this Deer Feed Block. This large feeder block was specifically designed for deer, providing them additional proteins, vitamins, and minerals for a viable population. The corn and grain base offers a tasty treat, while cane molasses, salt, and supplements provide vital parts of a deer's diet. Place this block near a water source, or where you see bucks and does foraging, for a fun food option. Help the deer population flourish by offering this Deer Feed Block. Guaranteed Analysis: minimum crude protein 10%, minimum crude fat 0.5%, maximum crude fiber 6%, minimum calcium 3%, maximum calcium 3.5%, minimum phosphorous 0.8%, minimum salt 7%, maximum salt 8.4%, minimum magnesium 1.5%, minimum vitamin A 25,000 IU/lb., minimum vitamin D-3 5,000 IU/lb., minimum vitamin E 5 IU/lb.